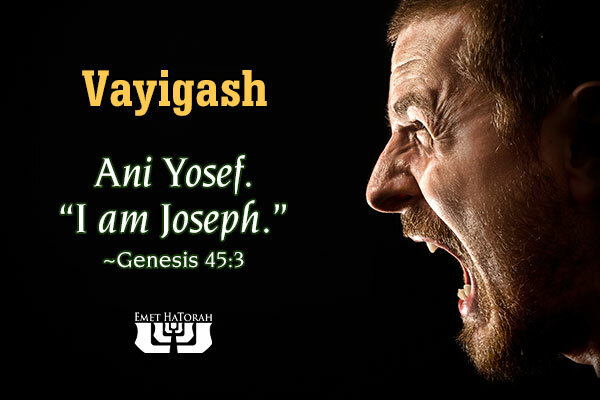 Ani Yosef—“I am Joseph.” You could have heard a pin drop when Joseph spoke those two Hebrew words to his brothers. Their mouths fell open and their jaws nearly hit the floor. Their eyes bulged as they strained to recognize their younger brother hidden beneath the Egyptian garb. Confusion and despair rushed over them from head to foot in an instant. An icy chill coursed through their veins at the sudden realization that the man who stood in front of them—the second most powerful man in Egypt—was the one they had betrayed over twenty years previously. The next few seconds played out as if they were in slow motion as they began processing those two words. Their minds rewound the moment and zoomed in on his lips as he spoke, “Ani Yosef!” “Did he really just say what we think we heard?? ?” It probably seemed like an eternity as a million thoughts, fears, and regrets all collided in their minds simultaneously. Time stood frozen solid as the implications of this simple statement firmly landed on each of them. We are so dead … they probably thought to themselves. The ghost of Joseph has come back to haunt us and take us down to the grave with him! This explains why he has been so cruel to us! We are doomed! It probably took them a few moments more to realize that Joseph had said something else also. Something about their father. What was it? Oh, yes … he said, “Is my father still alive?” But they couldn’t answer. They were literally speechless. They were still in shock at the realization that Joseph was still alive and all of the potential ramifications of that reality. The Torah tells us, “His brothers could not answer him, for they were dismayed at his presence” (Genesis 45:3). Rather than beginning as a joyous family reunion of estranged brothers, their reunion with Joseph was initially infused with terror. What would he do? Would they all be sold into slavery for the rest of their lives? Or would they simply be killed for their cold-hearted betrayal of their younger brother? Simeon and Levi quickly glanced at one another as guilt and remorse flooded over them. At that moment, the cards were definitely not stacked in their favor, so they immediately braced themselves for the full impact of the wrath of Joseph. But it never came. He probably even had to repeat himself, “Is my father still alive?” Judah blinked. Reuben gasped. Gad exhaled deeply. Benjamin cocked his head in bewilderment as he attempted to process all that had taken place over the last few weeks. “Is my father still alive?” Joseph asked yet another time, with his voice choking and tears in his eyes. They still couldn’t answer him. So Joseph began to comfort their fears saying, “I am your brother, Joseph, whom you sold into Egypt. And now do not be distressed or angry with yourselves because you sold me here, for God sent me before you to preserve life” (Genesis 45:4–5). If it hasn’t been obvious, Joseph’s response is atypical. He doesn’t respond with anger. He doesn’t retaliate. He doesn’t harbor bitterness towards his brothers for literally “selling him out.” He sees everything that happened to him as part of a larger plan that God was weaving together over the many years of his misfortune in order to create something larger and more elaborate than a peaceful life for himself. God was using Joseph throughout his difficult life to accomplish His purposes in the earth, though he did not understand why at the time. His continual comfort, however, was his assurance that ultimately God was good, and He was constantly good, despite the circumstances Joseph found himself in. The Scriptures tell us “he kissed all his brothers and wept upon them” (Genesis 45:14). Because Joseph’s eyes were constantly on God and His gracious sovereignty, he did not look to man as the one who controlled his destiny—or his happiness. Yes, his brothers did something awful to him with ill intent. But he did not let that event be his filter for the rest of his life. His filter was God’s goodness. Therefore, his heart could never be bitter towards his brothers. They were merely tools in the hands of God to bring about His greater purposes. In this case, it was the salvation of the world. How could Joseph be bitter about that? The next time things don’t go our way, or we get frustrated, or we are mistreated, let’s step outside of ourselves and imitate Joseph. We can either allow someone else to control us, or we can control ourselves. No, we probably won’t understand our situation any better, but we can make the choice to overcome our flesh and find comfort in the goodness of our Creator. We can become bitter, or we can become better. The choice is ours.